A pastor who bought a Lamborghini for his wife's anniversary present is said to be living lavishly in a $1.8million home which was bought by the mega-church he works for. 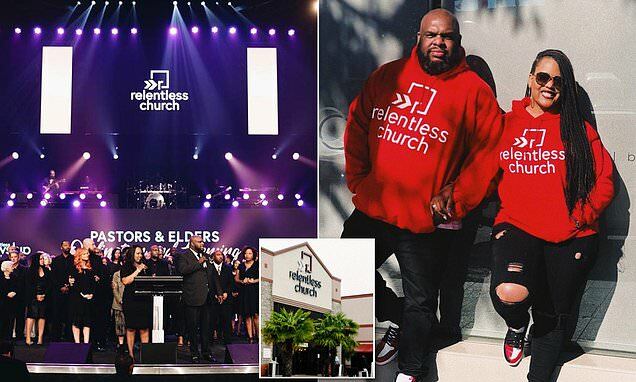 Pastor John Gray, who leads the Relentless Church in Greenville, South Carolina, is said to live in a 7,247 square foot home in Simpsonville, South Carolina, that was purchased by the church, according to the Greenville News. The home, which supposedly serves as a church parsonage, is said to be about 10 miles away from the mega-church and is located in a gated subdivision. The median home value in Greenville County, where Gray's abode is located, is said to be $165,600. When asked about the decision to buy the $1.8million home for Gray's use, Relentless' chief financial officer, Travis Hayes, told the the Greenville News that it 'is not anything new. 'This is a practice that is done with every denomination in the nation. That’s what this is. This is an asset that belongs to the church,' Hayes said. Should Gray opt to part ways with the church, it's expected that Gray will leave the home behind. Hayes told the newspaper that the church board had decided to buy the home as incentive for someone of Gray's 'caliber' to move to Greenville to lead the church. Gray's million-dollar housing situation revelation comes just over a month after it was revealed that Gray had purchased his wife, Aventer, a $200,000 Lamborghini Urus as an anniversary present. Gray, who is also an associate pastor at televangelist Joel Osteen’s Lakewood Church in Houston, Texas, was roundly criticized on social media after video of him presenting Aventer with the keys to the luxury vehicle during their eighth anniversary vow renewal was posted online.